Starting in 2015, Syracuse University began multi-year research study to determine the impact of the Inner Strength Teen Program on its high school participants. The scales chosen measure quantifiable improvements in several key metrics: Self Regulation, Self Compassion, and Perceived Stress. Teen mindfulness research studies showing improvement in self regulation give a quantifiable way to tell if – as a result of training or intervention – students are better able to manage their emotions, desires, fears, frustrations. Improvements indicate that kids are able to postpone short term reactivity for longer term results. They are better able to keep their focus when the environment around them is attempting to pull their attention away from the task at hand. 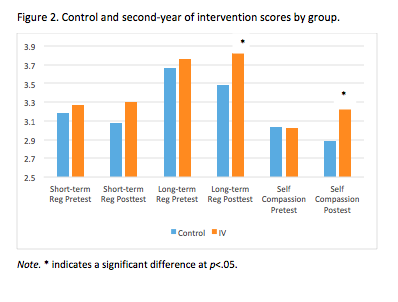 Among those students in the Inner Strength Teen Program who were tracked for 12-weeks with pre- and post tests, a statistically significant percentage showed measurable improvement both in self regulation and in self compassion (the perceived stress index was introduced following these results, reports will be available in 2019). The results to date are very encouraging, confirming the anecdotal reports from teachers, principals, and the students themselves. To further study the effects of the program, and to continue to improve the curriculum, the study has be expanded and will continue for another year. Access the researchers’ writeup of their findings to date here. Download full research study here. Rachel Razza, Ph.D., is an Associate Professor in the Department of Human Development and Family Science at Syracuse University. Her research focuses on self-regulation in children and youth. Specifically, her work explores contextual predictors of self-regulation, and implications of various self-regulatory skills for children’s school readiness and later school success. Her recent work examines mindful yoga as an intervention strategy to enhance these skills among children. Dr. Razza teaches courses on child development and developmental theory and serves as the Graduate Director and coordinator for the Mindfulness and Contemplative Studies minor. Dessa Bergen-Cico, Ph.D., is an Associate Professor in the Department of Public Health at Syracuse University, a Certified Addiction Specialist (CAS), and is a Certified Mindfulness Based Stress Reduction (MBSR) Teacher. She teaches and conducts research on the efficacy of mindfulness-based practices for fostering self-regulation among children and adults, reducing trait anxiety, reducing posttraumatic stress, and prevention of addictive behaviors. She is also the author of the book War and Drugs: The Role of Military Conflict in the Development of Substance Abuse. Dr. Razza and Bergen-Cico have been collaborating as independent evaluators of mindfulness-based interventions for children and youth since 2012. Their research has examined the effectiveness of multiple mindful yoga programs for children from preschool through middle school as well as mindfulness-based curricula for high school students. Collectively, their work has highlighted the benefits of these programs for aspects of children’s self-regulation as well as related socioemotional competencies including empathy and compassion. The following is a partial list of publications Dr. Bergen-Cico and Dr. Razza have written on the efficacy of yoga and mindfulness-based practices. To find our more details about the 2017 Research Study, contact Amy Edelstein. If your school is already running the Inner Strength Teen Program and would like to be included in the research study, please access all relevant documents here.